If you want a tropical paradise packed with as much or as little as you&apos;d like to do, look no further a St. Thomas honeymoon. A St. Thomas honeymoon is the epitome of an incredible beach vacation; powdery beaches, turquoise ocean & chilled Caribbean vibes. But when you tire of lazy beach days, St Thomas is jam-packed with activities. Swim with sea-lions at Coral World Ocean Park. Walk botanical gardens at Hawk or St Peter Greathouse Estate. Or seek out a thrill with a zip-line through the rainforest. St Thomas is a shopper’s paradise with a long history of trade that dates back to the 18th century. Bargains can be had on jewelry, perfume & liquor with some of the most generous duty-free allowances in the Caribbean. Shoppers should head to Main St in Charlotte Amalie or Havensight Mall near the cruise terminal. 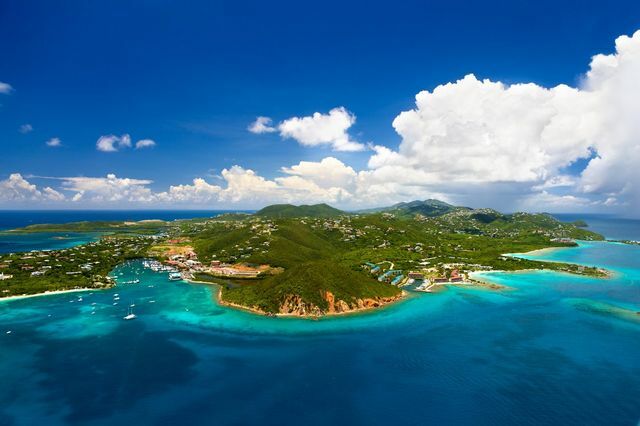 St Thomas is well connected if you fancy an adventure and some island hopping with the British Virgin Islands & St Croix nearby. St Thomas is neighbor to St John; the smallest of the US Virgin Islands is just 4 miles away by boat and offers friendly locals, colorful coral reefs and a national park that covers 60% of the island. Head to Trunk Bay which is often voted as one of the world’s best beaches! You can also take day trips to Hassel Island where you can explore many historic sites or Buck Island and snorkel its underwater trails. A St. Thomas honeymoon is ideal for any type of couple—whether you're looking for the ultimate in relaxation or adventure. St Thomas has fairly consistent temperatures all year round but be aware that hurricane season runs from July to November. Prices for St. Thomas resorts are at their highest from mid-December to mid-April with February being the busiest month. April to June offers great weather for St. Thomas honeymoons with some of the best value if you're looking to save money. Relax at Magens Bay If you’re lucky, you’ll catch a glimpse of a guy climbing a palm tree with his bare hands and feet. Give him a few dollars and he’ll cut you down a coconut so you can enjoy some fresh coconut milk on the sand. Visit Coral World Ocean Park & Undersea Observatory Have the chance to feed stingrays, get up close and personal with sea-lions & turtles or trek along the ocean floor at this ocean park. Spend the rest of your day just steps away at beautiful Coki beach. Take a trip to St. John Take the four mile boat ride and explore this small island known for its national park and pristine beaches. Enjoy duty-free shopping With some of the best shopping and biggest duty-free allowances in the Caribbean, make sure you pack an extra suitcase to take home some of the great deals from your St Thomas honeymoon. Visit Blackbeard’s castle For an excellent 360 degree view of Charlotte Amalie, visit this Danish lookout tower from 1679 or cool off in the swimming pool that lies in its shadows. Take in the Sunset on the Skyride Take the seven minute tramride up to Paradise Point and enjoy the breathtaking views across the azure, Caribbean Ocean and then pink, picture perfect town beneath. Explore Fort Christian Built in 1672, this National Historic Landmark houses art and artifacts from the island’s colourful past. Visit Buck Island Snorkel along the underwater trails with the turtles or visit the Danish Lighthouse at this National Wildlife Refuge. Eat out at Red Hook or French Town If you’re looking for the best spot to have dinner, head to one of these areas for a variety of restaurants and cuisines that won’t disappoint.